Description In a word of paper,there is a flying pig.One day,the pig plan to fly to see the outside world.But hitting the pillar will kill him.So,can you help him with avoiding pillars? 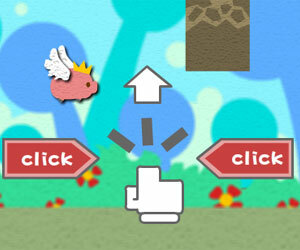 Controls Change the flight height of pig by rhythmic click to avoid pillars.Your scores add by avoiding the pillar. In a word of paper,there is a flying pig.One day,the pig plan to fly to see the outside world.But hitting the pillar will kill him.So,can you help him with avoiding pillars?